Pakistan 4-192 (Misbah-ul-Haq 57*, Shoaib Malik 35*, Robin Peterson 2-52) beat South Africa 191 (Farhaan Behardien 58, Robin Peterson 44, Mohammad Irfan 4-33) by six wickets (Duckworth/Lewis method). The Proteas were bowled out for 191 runs in 43.2 overs and Pakistan powered 192 for the loss of just four wickets and 28 balls to spare. 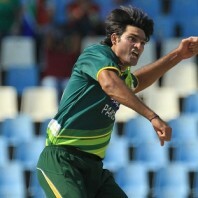 Mohammad Irfan (Pakistan) was declared ‘Player of the match’ for his excellent bowling figures of 4-33. The second One Day International of the four match series was played on Friday, March 15, 2013, at SuperSport Park, Centurion. The game was reduced to 44 overs due to rain interruption. Earlier, the South African captain, AB de Villiers, won the toss and chose to bat first on a good looking batting track. 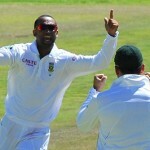 The experienced duo of Hashim Amla and Graeme Smith started off briskly and collected 22 runs in the first four overs. 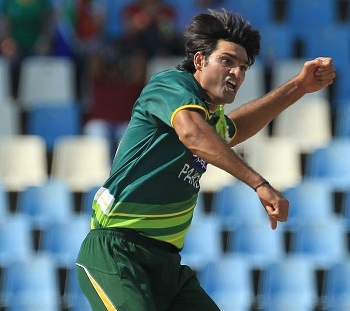 The left arm lanky fast bowler, Mohammad Irfan, tortured the hosts by grabbing two quick wickets in the next over. Hashim Amla was caught behind by the wicketkeeper Kamran Akmal for 17 and Colin Ingram was gone on the very next ball in an identical manner for a duck. AB de Villiers did not stay long at the crease and was caught smartly by Younis Khan off Mohammad Irfan again for four runs. Graeme Smith multiplied the miseries of the Proteas when Kamran Akmal held his catch off Junaid Khan for 10 and they were reeling at 4-43 in 7.5 overs. Faf du Plessis and Farhaan Behardien tried to stabilise the innings but they were successful in adding just 19 runs to the score when the first became the fourth victim of Mohammad Irfan for 17. Ryan McLaren joined together with Behardien at a crucial stage as the latter kept on stealing the boundaries regularly and the first hundred of the innings appeared on board in the 19th over. McLaren scored 17 when he was declared leg before wicket off Mohammad Hafeez and was replaced by Robin Petersen. The pair kept on creeping as Farhaan Behardien reached his maiden ODI fifty in the 30th over. The score was enhanced to 173 in 38.3 overs when Behardien was caught at deep square leg by Shoaib Malik off Mohammad Hafeez for 58 from 82 deliveries with 5 fours. The play was interrupted by rain after 38.4 overs and was resumed after about 02 hours and 26 minutes. The game was reduced to 44 overs per side and the innings of the hosts was rolled back for 191 in 43.2 overs as Robin Petersen was the last batsman who went back to the pavilion for 44 runs. Mohammad Irfan was the star performer with four wickets whereas Junaid Khan, Saeed Ajmal and Mohammad Hafeez shared two wickets each. Pakistan got off to a slow beginning with Nasir Jamshed and Mohammad Hafeez and scored just five runs in the first three overs. The latter opened up in the next over and added 11 runs with 1 six and 1 four as Nasir Jamshed played the role of a silent partner. Mohammad Hafeez survived a huge lbw shout on the second ball of the seventh over and was dropped by Ryan McLaren at cover off Kyle Abbott at 17. 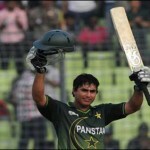 Nasir Jamshed was caught by Graeme Smith off McLaren for 10 as the score reached 29 in 7.5 overs. 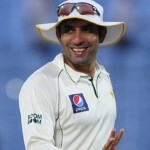 Kamran Akmal came in next, hit a four on the very first ball he faced and speeded up the run rate with Mohammad Hafeez. They shared a 34 runs partnership when Mohammad Hafeez was gone for 31 off 49 with 1 six and 3 fours. The second wicket fell at 63 and Kamran Akmal was bowled by Robin Petersen for 18 after six runs were added to the total. The seasoned campaigners of the Green Shirts, Younis Khan and the skipper, Misbah-ul-Haq associated in the center as the first was given lbw by the field umpire but existed after the review. The batsmen crawled to 91 in 23 overs and added 12 runs in the next over with 1 six and 1 four whereas an urge of speedy scoring was witnessed instantly. The score was lifted to 115 in 25.4 overs when Younis Khan was caught by Hashim Amla off Peterson for 32 from 41 balls with 3 fours. Shoaib Malik was the last competent batsman who took guards at the wicket and saw off few overs with Misbah-ul Haq. They picked up the run rate from the 30th over when they gathered 10 runs with one six from the latter. Shoaib Malik punished Lonwabo Tsotsobe for 16 runs two overs later with 4 well timed four as the 34th over resulted in 13 runs with 1 six from him and 1 four from Misbah-ul-Haq. The Green Shirts required 20 runs to win the match in 48 balls as Misbah-ul-Haq achieved his 21st ODI fifty in the 39th over. He stood firm at his crease for 57 off 73 with 3 huge sixes and even fours, Shoaib Malik assisted him well by unbeaten 35 from 38 with 1 six and 4 fours as Pakistan attained the target after scoring 192 runs in 39.2 overs. Robin Peterson was the top wicket taker with two whereas Dale Steyn and Ryan McLaren claimed one wicket each. Pakistan won the second ODI easily with a margin of six wickets and squared the five match series at 1-1.The third ODI will be played on March 17, 2013, at New Wanderers Stadium, Johannesburg.